Hamilton students join Yellowstone field science program - Hamilton School District. Hamilton High School science teacher Alan Simays organized a group of 14 students to participate July 19-27 in the Wildlife Ecology Program in Yellowstone. The program is offered through Ecology Project International (EPI), a field science and conservation organization that partners scientists with local and international students and educators in ecologically critical environments in the Galapagos, Ecuador, Costa Rica, Baja, Hawaii, Belize and Yellowstone. Hamilton students will work directly with National Park Service researchers and scientists to better understand the wildlife that shape the park. 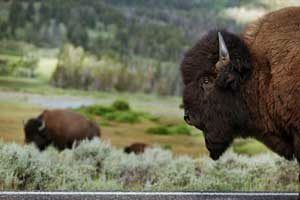 Students will focus on Yellowstone’s ungulate populations, like bison, collecting data for a groundbreaking grazing survey that aims to understand how and why ungulate herds move through the park. They’ll spend time observing wolves on the remarkable Yellowstone landscape and learn about their history in the park, while also traveling to Yellowstone’s iconic geothermal features and investigating their own research projects. EPI’s mission is to improve and inspire science education and conservation efforts worldwide through field-based student-scientist partnerships. For more information on EPI’s programs, visit www.ecologyproject.org.